Iraqi troops are advancing from four fronts on Mosul, the last major IS holdout in Iraq. New reports emerged Friday of public killings and other atrocities committed against Mosul residents by Islamic State militants, including dozens of civilians whose bullet-riddled bodies were hung from telephone polls after they were accused of using cellphones to leak information to Iraqi security forces. The United Nations human rights office said IS fighters killed some 70 civilians in Mosul this week, part of a litany of abuses to come to light in recent days, including torture, sexual exploitation of women and girls, and use of child soldiers who were filmed executing civilians. The revelations are the latest reports of IS brutality as the group retreats into dense urban quarters of Iraqi’s second-largest city, forcing the population to go with them as human shields. In its report, the UN human rights office in Geneva said IS shot and killed 40 people on Tuesday after accusing them of “treason and collaboration,” saying they communicated with Iraqi security forces by cellphone. The bodies, dressed in orange jumpsuits, were hung from electrical poles in Mosul. A day later, the extremists reportedly shot to death 20 civilians at a military base. Their bodies were hung at traffic intersections in Mosul, with signs saying they “used cellphones to leak information.” A Mosul resident, reached by telephone, said crowds have been watching the killings in horror. One victim was a former police colonel, he said, speaking on condition of anonymity out of fear for his safety. The violence is part of a disturbing pattern. As the army advances, IS militants have been rounding up thousands of people and killing those with suspected links to the security forces. Soldiers last week discovered a mass grave in the town of Hamam al-Alil, 20 kilometers (12 miles) south of Mosul, containing some 100 bodies. At the same time, the militants have gone door to door in villages south of Mosul, ordering hundreds to march at gunpoint into the city. Combat in Mosul’s dense urban areas is expected to be heavy, and the presence of civilians will slow the army’s advance as it seeks to avoid casualties. IS militants have boasted of the atrocities in grisly online photos and video. The United Nations has urged authorities to collect evidence of IS abuses of civilians to use in eventually prosecuting the militants in tribunals. Iraqi troops are advancing from four fronts on Mosul, the last major IS holdout in Iraq. As Iraqi special forces battle in eastern neighborhoods of the city, Kurdish peshmerga forces are holding a line north of the city, while Iraqi army and militarized police units approach from the south. Government-sanctioned Shiite militias are guarding western approaches. In the formerly IS-held town of Bashiqa, northeast of Mosul, Kurdish commander Gen. Hamid Effendi said his forces were working to secure the area but faced booby traps that were holding up the advance. More than a thousand unexploded bombs are believed buried in Bashiqa, Effendi said. Over 100 IS fighters have been killed in combat, he added, but wounded fighters likely remain in defensive tunnels built by the militants. On Friday, teams went building by building into the night detonating explosives left behind in Bashiqa, which was deserted except for a few residents trickling in to check on their homes and businesses. Among them was 60-year-old Khan Amir Mohammed, who discovered that his home had been turned into a mortar post by the militants, who dug seven tunnels on his family’s 3 1/2-acre property before retreating. Ammunition tubes and English-language instruction pamphlets for launching mortars littered the floor in one room. Another had been turned into a makeshift mosque, with lines taped to the floor for worshippers to line up to pray. A nearby shop where Mohammed sold animal feed had collapsed from an apparent airstrike. “What can I say? I feel powerless,” he said, surveying the destruction. 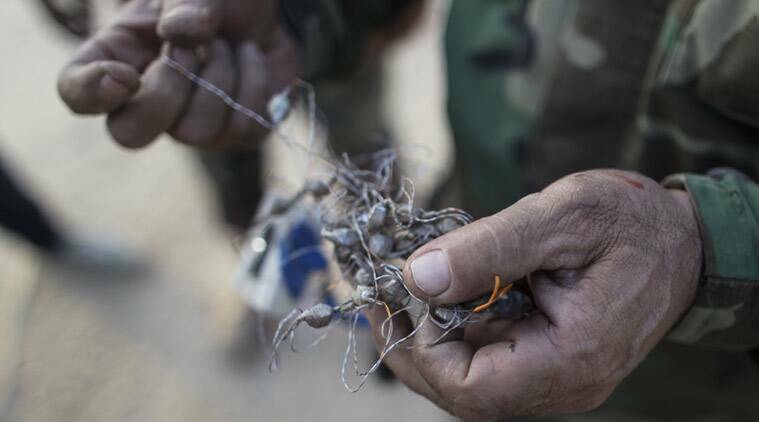 Down the road, Kurdish forces were detonating bombs left behind by the militants. First Sgt. Ayub Mustafa said his unit alone had disabled some 250 bombs, the vast majority homemade explosives. “Apparently they have a smart electrician with them. They’re well-made,” he said. Special forces troops entered the Qadisiya neighborhood on Friday, the 26th day of the campaign to retake Mosul, exchanging small arms and mortar fire with IS positions and advancing slowly to avoid killing civilians and being surprised by suicide car bombers, said Brig. Gen. Haider Fadhil. Regular army troops control 90 percent of the Intisar neighborhood, said one officer, but progress has slowed because “the streets are too narrow for our tanks.” He spoke on condition of anonymity because he was not authorized to brief reporters. Meanwhile, the U.N. cited new evidence the militants have used chemical weapons, escalating fears IS will resort to chemical warfare to try to hold onto the city, still home to more than a million people. She also noted a video posted online by IS on Wednesday showing four children, believed to be aged 10 to 14, gunning down four people accused of spying for Kurdish and Iraqi security forces. UN officials say about 48,000 people have now fled Mosul since the government campaign began on Oct. 17.